Street Parking – Free after 7 pm. 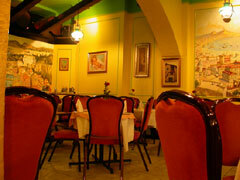 Trattoria Verdi is a classic, family-owned Italian restaurant serving authentic Italian food at very reasonable prices. It splits into three bright and airy sections. The relaxed atmosphere and friendly yet efficient service of the management is an added bonus. The decor is bright, vibrant and charming. It's a lively restaurant where flavour and authenticity matter above all. The food and service is wonderfully complemented by their gifted pianist, Prepare to be dazzled by his astonishing rendition of Bohemian Rhapsody complete with guitar solos and operatic vocals, all on piano. Trattoria Verdi is a superb choice for family parties, birthdays, anniversaries and business events and romantic evenings. There are 2 private rooms in the lower ground seating up to 25 and 35 people and can be combined to host a party of 60 . The main ground floor restaurant can seat up to 85 people. With its live relaxing music by a gifted pianist, its Venetian design and private corner tables, Trattoria Verdi makes a wonderful venue for a romantic dinner. The tempting menu is filled with fresh and flavorsome Italian menu classics. A must try for any seafood lover. Why not try the delicious Dover Sole (meuniere) with garlic cr�me butter or tasty Halibut with dill sauce, both served with steamed greens.